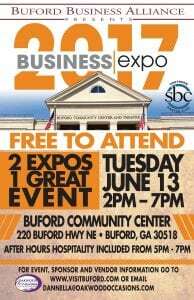 Cook Construction | Real Estate will be on site at the 5th Annual Buford Business Alliance Expo at the Buford Community Center on June 13th, 2017 from 2 to 6 PM. Cook will be providing information to the public about opportunities to provide services in all sectors of their brand portfolio including general contracting services, property management, residential construction communities, real estate services, and the charitable foundation arm of the business. The Buford Business Expo is hosted by the Buford Business Alliance each year to provide a free community event for the local area to visit new businesses and network with new potential business contacts. The event will feature vendor booths throughout the day from businesses around the Buford area. Immediately following the event will be an open after-hours and hospitality for the Buford Business Alliance from 5 to 7 pm. Those in attendance will receive goody bags valued at $300 each. All are welcome to attend. Cook Construction | Real Estate’s brand portfolio which also includes Cook General Contracting, Cook Management, Cook Real Estate Services, Cook Academy of Real Estate, Cook Grading, and the Cook Cares Foundation.